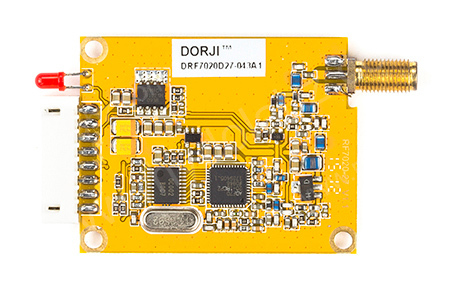 Description: DRF7020D27 is a type of high integrated, high power consumption transceiver based on ADF7020 RFIC. Innovative coding technology EDAC (looped interleaving Error Detection and correction) is utilized to assure reliable communication and achieve longer distance comparing to other common coding technology. 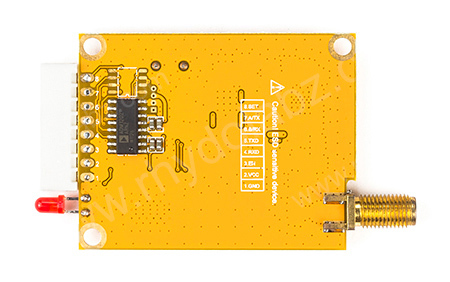 DRF7020D27 module can work at configurable channels which expands the capacity of modules in the same location. The FSK data rate, serial port data rate and output power can be changed through online setup tool. The module works at wide voltage range(4.7~8V) with sensitivity up to -117dBm. It can send any size of data package transparently and users don't need to make any complicated configuration and programming. When combining with Level Converter board, DRF7020D27 module can be converted to RS232 interface module and communicate with PC or other RS232 equipment easily. The standby current is less than 5uA , which makes it suitable for battery powered-up applications.